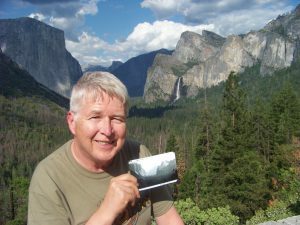 Week 4 Days 27-29 We know we wrote about Grand Canyon being the “granddaddy” of them all, but, after three days in Yosemite we want to temper that a bit. This being both Lynn and my first trip to Yosemite, we found it absolutely gorgeous. It seemed to invite further exploration everywhere we turned. Our early Memorial Day start from Fresno paid big dividends. 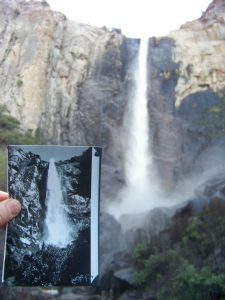 One definitely needs a plan to tour Yosemite. We arrived at our target parking lot and ten minutes later the Park Service declared it “FULL” with a 2-hour wait! 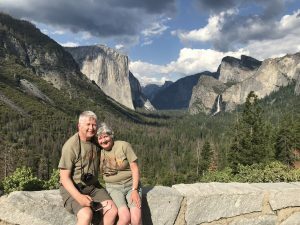 Earl and Ethel capture three main photos: Tunnel View, Bridal Veil Fall, and Glacier Point. 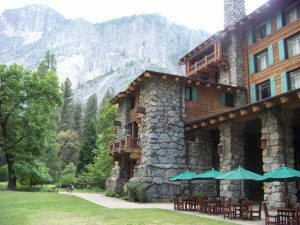 All three are part of any top five “don’t miss” list for Yosemite. We remain in awe on how these two young travelers knew about these prime locations and how to get to them. 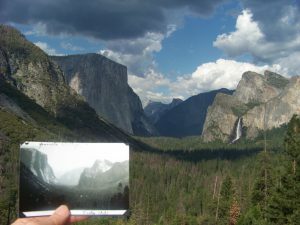 Tunnel View captures the depth and breadth of the 7-mile-long by ¾ mile wide Yosemite Valley flanked by 2,000 to 3000-foot-tall granite canyon walls on either side. 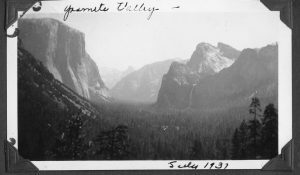 Tunnel View is at an overlook located at tunnel exit on one of the three roads leading into the valley. Bridal Veil Fall is the first of many large waterfalls that one sees traveling further into the valley. 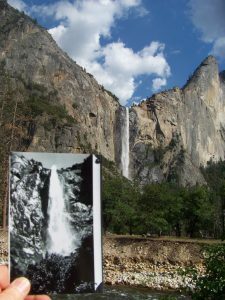 Their photograph of Bridal Veil Fall was highly appropriate for a young couple on their honeymoon! 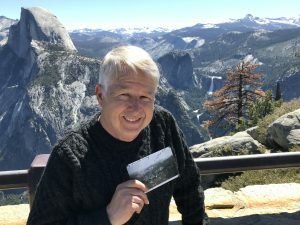 When I first saw Earl and Ethel’s Glacier Point photo I was dumbfounded as to how they took it? As mentioned, we knew very little about the park. It seemed to us that their photo was taken from airplane or if not, then certainly at the top of a high mountain. How did they get so high? 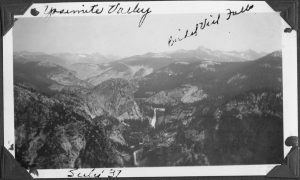 Only later on researching the park did we learn that trips to Glacier Point have been part of the Yosemite “package” since the late 1800’s. 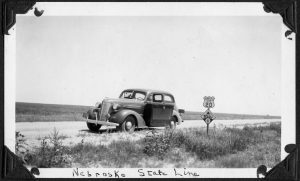 Early travelers would take days on horse-drawn wagons to reach the same location. 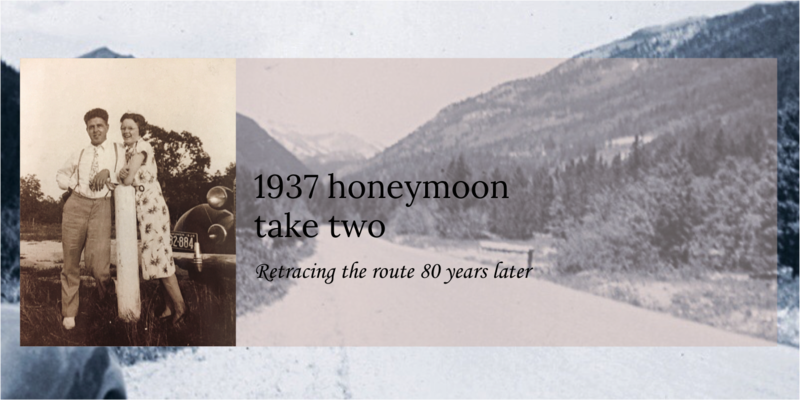 We complained when we traveled the twisty-turning 30-mile from our hotel in about an hour! 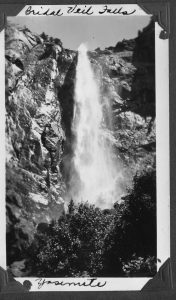 The waterfall in Earl and Ethel’s photo is labeled “Bridal Veil Falls.” It is actually Nevada and Vernal Falls. We will allow the honeymooners this liberty! 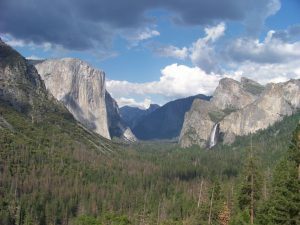 Another of Yosemite’s top five sights, Half Dome is in the top left of the photo. A climber fell to his death from the top last week. 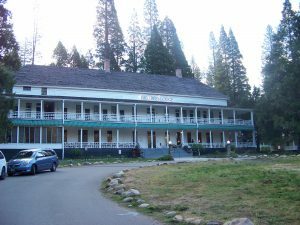 The first such death in Yosemite since 2010. We saw many other wonders in our three-day visit. We share a few without digressing too much from our main story. 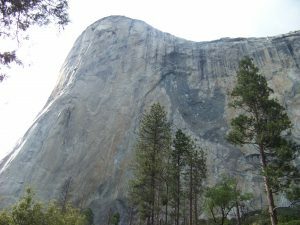 El Capitan is another of the five great sights of Yosemite. Unfortunately another two climbers fell to their death today from this rock face (Sat. June 2). 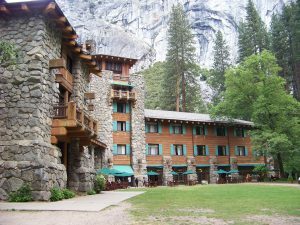 Constructed in 1927, the Majestic Hotel is the premiere lodging facility in Yosemite. It is on the National Registry of Historic Places. 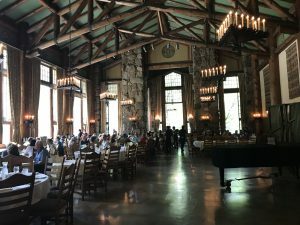 We enjoyed a wonderful lunch in this historic dining facility! Our lodging in the park for three nights was The Big Trees Hotel. 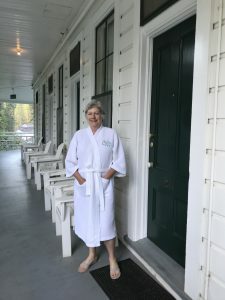 Built in 1879, it put one in mind of the Grand Hotel at Mackinac Island. There’s something about a place with history. 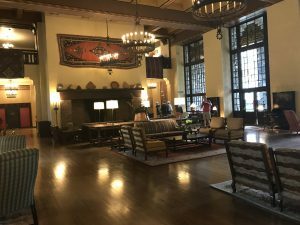 Mark Twain slept here on his visit! Outside our room. No invitation needed to sit back and take it all in! 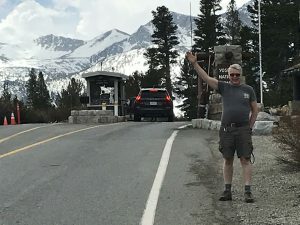 On day 3 in Yosemite we took a 25 mile drive on Tioga Road across the Sierra Nevada to the east entrance of the park. Elevation 9600 feet and into snow country! What a fabulous experience and beautiful photographs. An amazing trip. Thank you for taking us along! Breathtaking pictures. Weather looks like it has been good too. We continue to pinch ourselves on our good fortune with weather. It continues today in the Napa Wine country with 82 degrees and not a cloud. The park has been on my list for some time, you are confirming that it needs to be moved up. I have heard that the crowds at the park are a challenge at times, did you find that to be true? Yes, most definitely move it up. If you stay outside the park try to be in parking space by 9 a.m. and then take the park bus shuttles for the rest of the day. 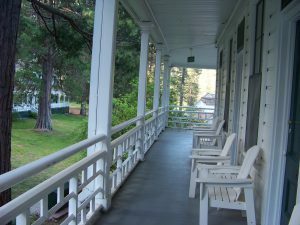 Even if you stay in the park at one of the lodges it is the same story. Park by 9 a.m. and then enjoy the rest of the day. There will be other travelers though. Everyone is fairly polite though. Everyone is blown away by the beauty, as we were. 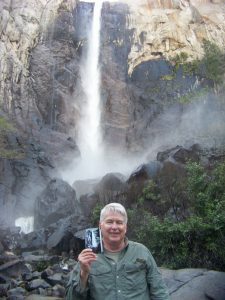 Hi Carl & Lynn, I am “catching up” with you on your honeymoon travels. I just can’t stop reading about your amazing trip! 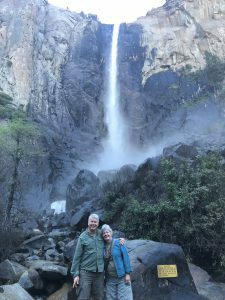 Yosemite brought back a few memories for me, as Arno & I also spent part of our honeymoon camping in Yosemite. Safe travels! Wonderful! So far, I vote for your 3rd picture to be the one on your Christmas Card if that is what you do…. Yes, that is one of our favorites too. It is already our “wallpaper” on our laptop!